You are here: Home / All blog posts / Hello, world! We had the usual setting-up problems – some crossed threads, etc. – plus shaft #17 was floating for no reason I could particularly fathom. As a result, we didn’t get everything resolved yesterday evening, despite working late into the night. But I got up this morning, and…ta-daa! So there you have it: Emmy is ready to weave! 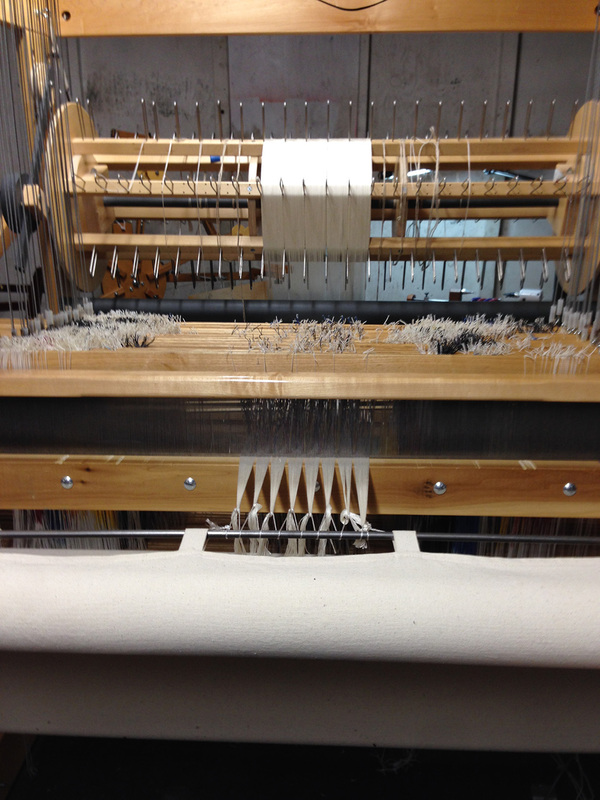 I’m super excited – it’s been almost exactly two months since I bought her, and probably about a month and a half since I’ve woven anything at all. I’ve definitely been feeling weaving withdrawal, so it will be nice to start making cloth again. What’s the plan for this warp? Well, first I promised Alfred I’d weave him some pomegranates, so I’ll do a scarf in a pomegranate pattern. Then, there are samples for the Twenty Four More Or Less study group for Complex Weavers, which are due on February 15, and a project for Handwoven, due shortly thereafter. And I plan to weave a whole bunch of samples to donate to the CNCH Special Sample Service. So nothing terribly ambitious, artistically speaking, but a nice collection of simple projects that will also allow me to get used to Emmy, get everything adjusted just so, and come out full of energy for the next warp. The kittens are off chasing each other around the house right now, but here is a photo from my mom’s visit. 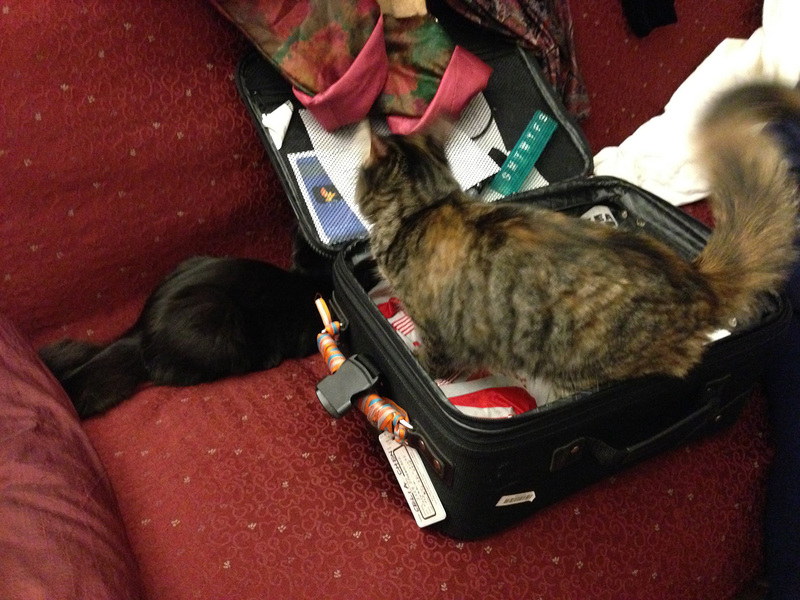 Tigress is quite an expert with luggage by now – you open it, she sits in it. 🙂 Of course, Fritz is curious too – but he prefers to investigate the outsides of things, while Tigress takes the inside approach. My cat Pepper did the exact same thing as Tigress. 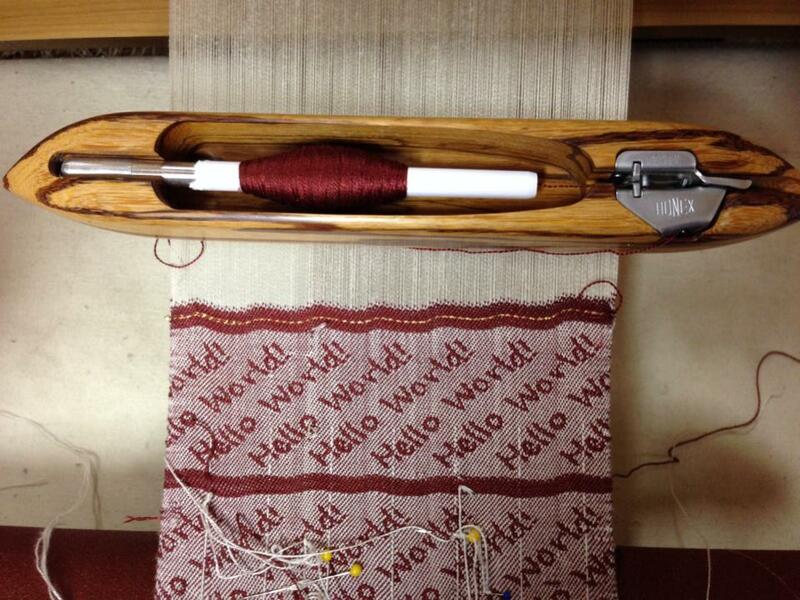 My question is what kind of warp do you use for silk weft. I’ve been collecting silk to try to weave with it but I’m wondering if I need to use silk warp or can I use a different kind of yarn for the warp? You can use a different warp yarn, though I’ve mostly warped with silk and used other fibers in the weft (when I mix fibers), as silk is much stronger than other fibers. But you should be fine warping up with something else! Yay Emmy! Can’t wait to see all the gorgeous things you weave on her.